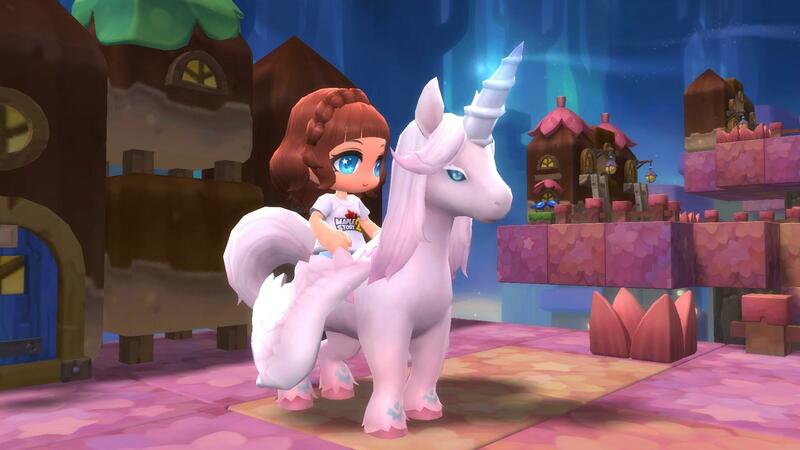 The latest MapleStory 2 Producer Blog touches on the mandatory topic for (nearly) every free-to-play game out there: Founder's Packs. These will be available as a pre-sale in a very limited amount on July 17, which incidentally is the day when you can pre-download the client, with the second closed beta starting on July 18. The MapleStory 2 Founder's Packs come in three flavors: Explorer Package ($24.99), Master Package ($59.99) and Legendary Package ($99.99). All of them include premium game time, in-game currency and the Prismatic Harmony Unicorn mount. It's the one that you can see right below. Of course, depending on the package that you purchase, you can expect things such as outfits, emotes, Founder's name tags, and a Soft Serve Tombstone, which is a… erm… stinky pile of stuff that spawns when you die instead of the regular tombstone. I guess there's something for everyone! The MapleStory 2 Founder's Packs will be officially sold before the official launch, but the pre-sale packs selling on July 17 will come with guaranteed access to the second closed beta. You can see all the contents on the latest Producer Blog.